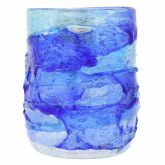 This exquisite Murano Glass tumbler handmade in the kilns on the famous glass-making island of Murano will make your mind instantly transport you to a classy canal-side Venetian restaurant. You will enjoy the drinks in style and think about Venice while receiving compliments from your guests on the most gorgeous drinking glasses they've ever seen. The raised texture of the glass swirling with warm aquamarine and amethyst shades and accented with sparkling silver foil creates a uniquely stylish look and makes an instant enchanting impression. These Venetian glasses are great for water or soft drinks, highball cocktails, mixed drinks, or wine, and look amazing in your china cabinet. Add famous Murano artistry and Venetian elegance to your dining table or make a luxurious gift to the special people in your life, and dream about Venice for years to come. 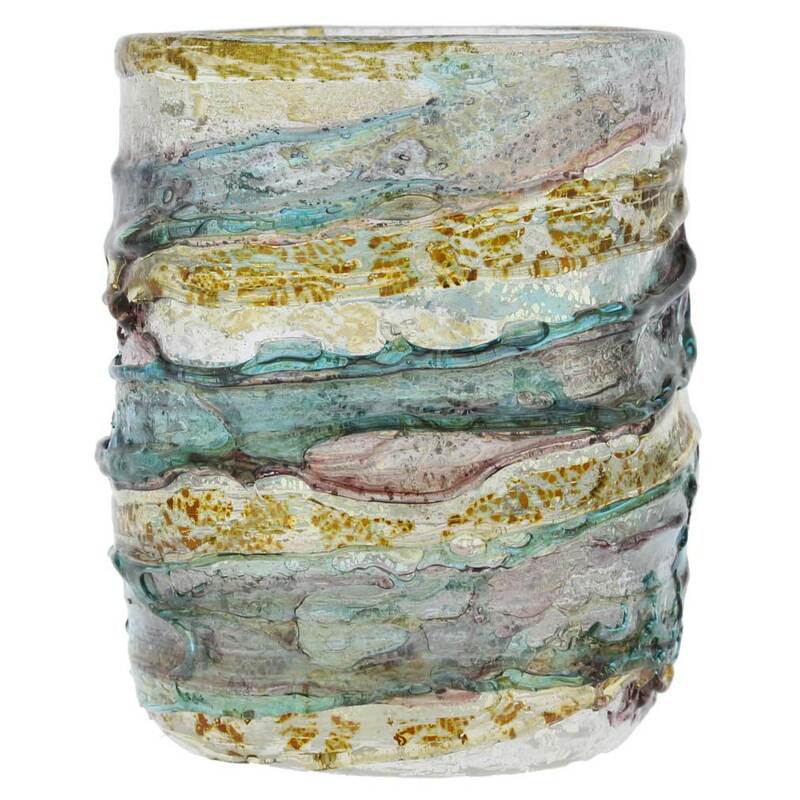 Measurements: Murano tumbler is approximately 4 inches tall and 3 inches in diameter in its widest part. 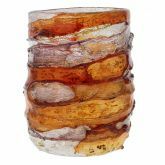 This Murano drinking glass was crafted by hand using only traditional glass-making methods and tools by one of the best Murano masters, whose work is exhibited in galleries and museums worldwide. This Murano drinking glass is signed by the master. Attached sticker of the Murano Glass consortium further proves its Murano origin, as does the certificate of authenticity that comes with the glass. Fast shipping and quick delivery. The glass itself is simply a beautiful work of art! It was my first order from Glass of Venice, but certainly not my last. The day I relieved the glass, I paced another order. I know we are all hesitant ordering from a company that we haven't used before, but Glass of Venice exceeded my expectations. That's not always easy to do. 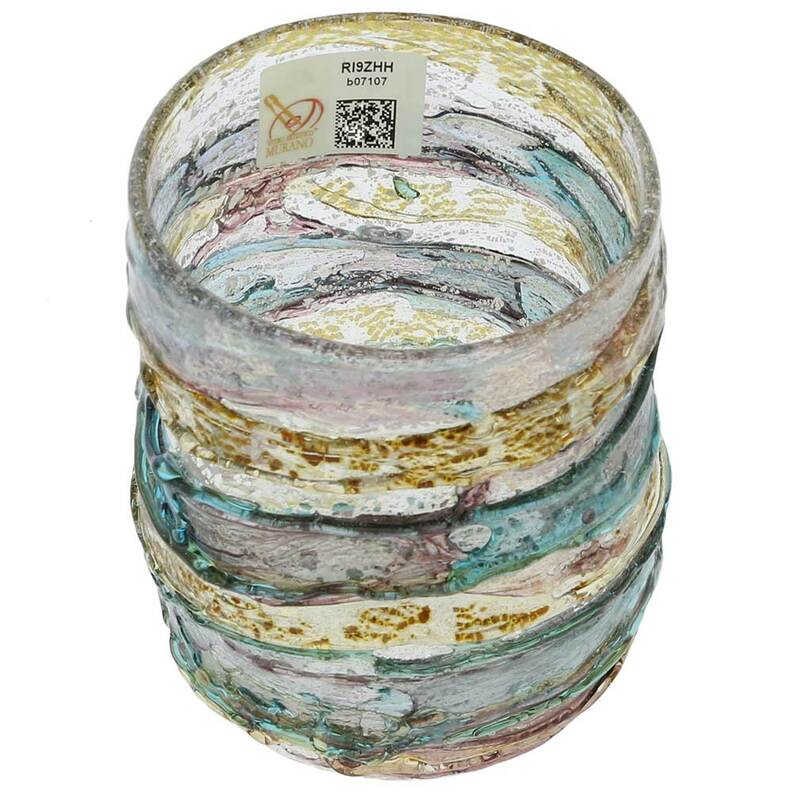 Sbruffo is a distinctive Murano Glass design, which features rough-surfaces and multiple colors layered on top of each other. 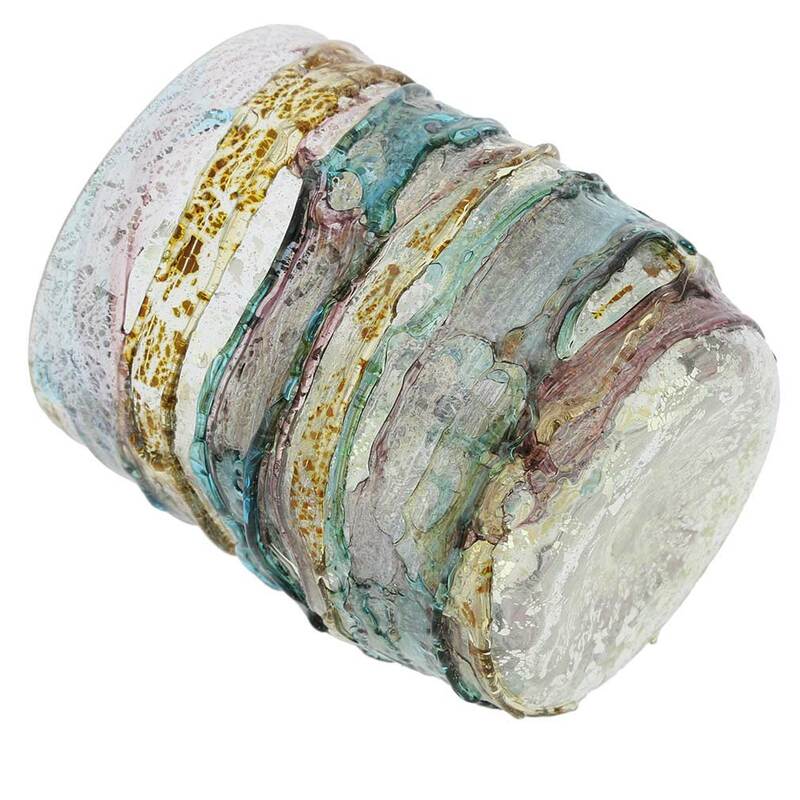 Sbruffo objects are made by putting layers of blown colored glass on top of a glass core, then breaking them off until just a thin and rough colorful layer on top remains. 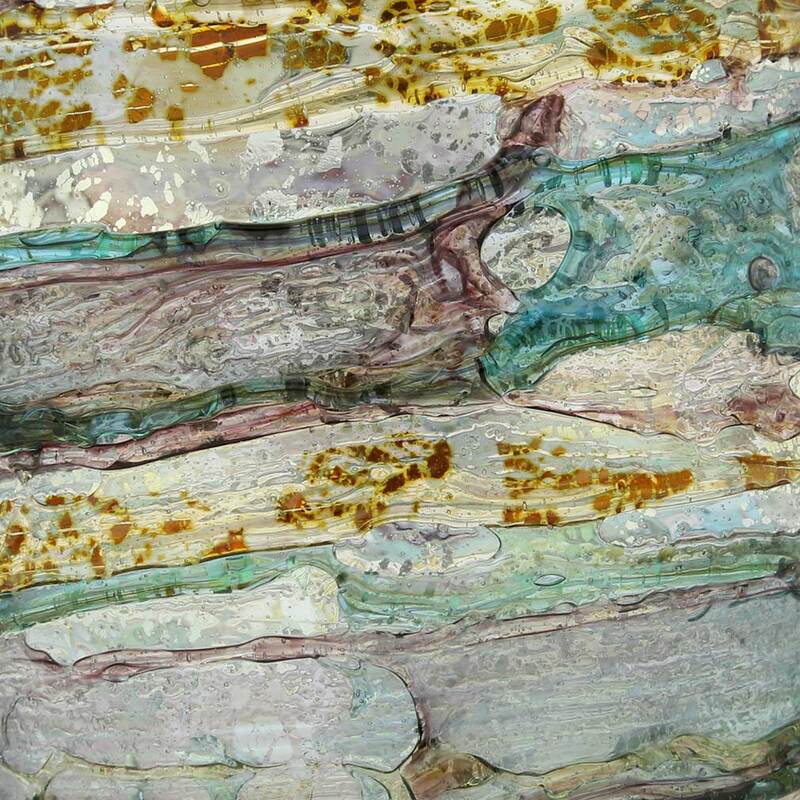 This process is then repeated over and over, until many rough layers are put on top of each other, creating an impression of flowing glass. The rough edges are then polished off. 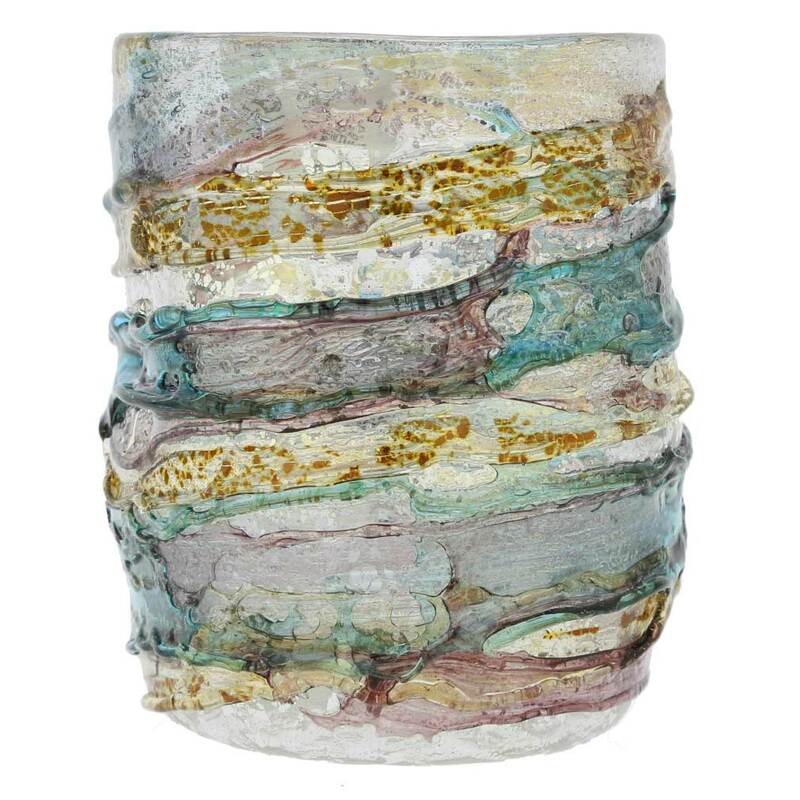 Using multiple colors and unique forms, the masters make tumblers, glasses, vases, bowls, and sculptures with sbruffo designs, which are instantly recognizable as authentic Murano Glass. Only a few Murano Glass factories and workshops still create sbruffo art glass objects, and many interior design aficionados, collectors, and Murano Glass fans seek these objects of refined beauty and distinct Italian elegance.